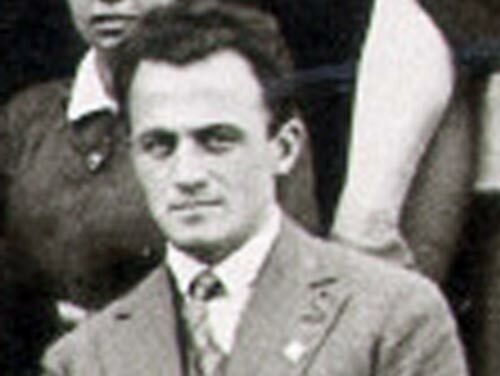 Emanuel Ringelblum joined JDC Warsaw in 1930. In 1938, he was sent by JDC to head the relief team in the town of Zbaszyn, where thousands of Polish Jews expelled from Germany were stranded. During World War II, he supervised the “house committees” that provided aid, organized cultural activities, and administered the soup kitchens that supplied meals to poor residents of the Warsaw Ghetto. Ringelblum headed the underground “Oneg Shabbat” archival group that recorded every aspect of ghetto life. He and his family were betrayed in 1944 while in hiding on the “Aryan” side of Warsaw. They were murdered in Pawiak Prison. Emanuel Ringelblum, one of the heroes of the Warsaw Ghetto, was born in the eastern Galician town of Buczacz (now Ukraine) on November 21, 1900. His mother died when he was twelve years old. During World War I, the family relocated to Nowy Sacz in Southern Poland near Krakow. In 1922, Ringelblum began his studies in the Faculty of Philosophy at Warsaw University. He completed his PhD in 1927. His thesis was titled Jews of Warsaw from its Earliest History until 1527. Ringelblum was married to Yehudit Herman and the couple had one son, Uri. For several years, Ringelblum taught history at the Yehudiya High School for girls in Warsaw. He published numerous works on Polish-Jewish history, concentrating on the history of the Jews in Warsaw, and edited scholarly journals on the history of the Jews in Poland. At the same time, he was active in public affairs. From an early age, he was a member of the Po’alei Zion Left, a Marxist-Zionist group. Ringelblum joined the JDC in Warsaw in 1930 as a part-time employee. Together with other staff members he helped establish gemiles khesed kasses [free loan societies], which numbered 870 in 1939. The JDC provided 50% of the capital on the condition that the applicant would contribute the other 50%. These free loan societies were of tremendous importance in maintaining the economic viability of the Jewish community, as Jews were not able to obtain loans from government sources or from Polish non-Jewish financial institutions. Ringelblum’s work with the free loan societies brought him in contact with Isaac Giterman, the JDC Director in Poland, a charismatic mentor who changed the course of Ringelblum’s life. Both before the war and in the Warsaw Ghetto, Giterman served as Ringelblum’s role model. Giterman taught his younger protégé to differentiate between self-help and traditional philanthropy. Ringelblum was a delegate to the Twenty-First Zionist Congress, held in Geneva in August 1939. He returned to Poland on the eve of World War II via Italy, Yugoslavia, and Hungary, as passage through Germany was no longer possible. After the German invasion of Poland in September 1939, Ringelblum became part of ZTOS (Zydowskie Towarzystwo Opieki Spoleczne) the Jewish Self-Help Society (later known as the JSS – Jüdische Soziale Selbsthilfe), which was officially recognized by the Germans. ZTOS provided assistance to the residents of Warsaw and to refugees who reached Warsaw from the surrounding towns and villages. Ringelblum sought to find housing for the refugees and for Warsaw Jews whose homes had been destroyed by German bombing. After the establishment of the Warsaw Ghetto in November 1940, ZTOS expanded its activities. Ringelblum headed the “Public Sector,” the department that oversaw the hundreds of “house committees” in Warsaw that promoted mutual assistance and organized educational and cultural activities. He supervised the soup kitchens set up by ZTOS, which provided meals for tens of thousands of impoverished residents of the ghetto. These soup kitchens provided opportunities for people to meet and served as a cover for underground political activities. Ringelblum also tried to arrange employment for the thousands of Jewish teachers, writers, and intellectuals in the ghetto who were left with no means of support. After the German occupation of Warsaw in September 1939, Ringelblum, together with a small group of friends, began to record in detail what was happening to the Jews of Warsaw and to the Jewish refugees who streamed into the city. With the establishment of the Warsaw Ghetto, Ringelblum decided to expand the group and to create an underground archive that would record every detail of life in the ghetto. Realizing that what was happening in the ghetto was unprecedented in Jewish history, Ringelblum wanted to leave a written record of the history of the ghetto for future generations. Ringelblum assembled a talented group of people, comprising a wide cross section of Warsaw Jewry, including such diverse figures as Shimon Huberband, an Orthodox rabbi and Yehuda Feld, an editor of the underground Communist Press. The group, known by the name “Oneg Shabbat,” met secretly on Shabbat (Saturday) afternoons to report on their work. Under Ringelblum’s guidance, they collected data on the entire spectrum of life in the ghetto: the cruelty and maliciousness of the Germans, the hunger in the ghetto, the living conditions, the medical and sanitary conditions, the schools and underground publications, the rumors, the jokes, and even the street life. The group collected information on labor camps and on the fate of Jewish communities outside Warsaw. Ringelblum initiated a major project to study the experience of the Jewish woman in the Warsaw Ghetto while, at his request, doctors in the ghetto conducted a study of the medical and psychological effects of hunger. Ringelblum himself recorded much of the history of the ghetto, focusing on the fate of communal leaders and institutions. The “Oneg Shabbat” archival group chronicled the fate of Warsaw Jewry during the period of the deportations from July-September 1942 as well as the first gassings at the death camp in Chelmno. This material was passed on to the Polish Underground, who forwarded it to the Polish Government-in-Exile in London. In this way, Ringelblum played a major role in bringing the German atrocities against the Jews in Poland to the attention of the outside world. During 1943, Ringelblum participated in the planning of the Warsaw Ghetto uprising and chronicled the events leading up to it. The reports and documents constituting the “Oneg Shabbat” were buried in the ghetto in milk cans and metal boxes with plans for their recovery after the war. Two sections of the archive were recovered in 1946 and 1950. A third section was never recovered. The Ringelblum Archive serves today as a major source for the history of the Warsaw Ghetto and constitutes an outstanding tribute to a most remarkable man. In March 1943, Ringelblum and his family were smuggled out of the Ghetto and hidden on the “Aryan” side of Warsaw under a greenhouse in the suburb of Ochota, along with about thirty other Jews. Two days before Pesach (Passover) in April 1943, on the eve of the Warsaw Ghetto uprising, Ringelblum entered the ghetto alone. During the uprising, which began on April 19, and for several months thereafter, nothing was known of his whereabouts. In July 1943, it was discovered that he had been taken to the Trawniki labor camp. Two members of the Warsaw Underground—a non-Jewish Pole and a Jewish woman—succeeded in smuggling Ringelblum out of the camp disguised as a Polish railway worker and returned him to Warsaw, where he was reunited with his wife and son. Ringelblum and his family were shot by the Germans amid the ruins of the Warsaw ghetto in March 1944. Eck, Nathan. Warsaw Story – JDC Archives, New York. _________The Jews of Warsaw – 1939-1943, Ghetto, Underground, Revolt. Bloomington: Indiana University Press, 1989. Huberband, Shimon. Kiddush Hashem: Jewish Religious and Cultural Life during the Holocaust. Edited by Jeffrey Gurock & Robert Hirt. New York: 1979. Kassow, Samuel D. Who Will Write Our History? Emanuel Ringelblum, the Warsaw Ghetto, and the Oyneg Shabes Archive. Bloomington: Indiana University Press, 2007. Kermish, Joseph, ed. To Live With Honor and Die with Honor! Selected Documents from the Warsaw Ghetto Underground Archives. Jerusalem: Yad Vashem, 1986. Mais, Yitzchak, et. al. Daring to Resist – Jewish Defiance in the Holocaust. New York: Museum of Jewish Heritage, 2007. Ringelblum, Emanuel. Notes from the Warsaw Ghetto: The Journal of Emmanuel Ringelblum. Edited and translated by Jacob Sloan. New York: 1958. Shulman, Abraham. The Case of Hotel Polski. New York: 1982.